Hi, my name is John Harrer. For thirty years, along with my wife, Ranae, we owned and operated a health food store in Bakersfield, California. Helping people live better, healthier lives was our goal and I think we succeeded. Not many retail outlets can say they survived for thirty years. In reality, our store, founded in 1948 by James Cayford, had a lifespan of over 60 years. After retiring from the retail business, I combined my passions for writing, audio production, and video production into John Harrer Freelance Productions. The Whoa Podcast about Horses and Horsemanship was founded in 2012. Our podcast is one of the longest tenured shows on iTunes. My love of horses came late in life. While my wife has owned a horse our entire married life, 35+ years, for me horse ownership began in 2005. My enthusiasm and thirst for learning are fueled by the feeling of “I have to catch up”. My novice mentally allows me to relate to many people new to horse ownership. My first blog began in 2003 as I chronicled the world around me in the retail business. 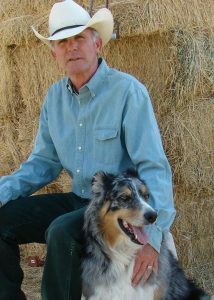 In 2008, I began writing about my equine experiences in my Training Jessie Blog. Later, I began producing videos detailing our training exercises, excursions, and experiences. To date, the John Harrer YouTube Channel consists of over 100 videos, with 800,000 views and over 2,000 subscribers. And, I continue to hone and refine my video making skills. In 2010, I began studying photojournalism by taking college level classes from career photojournalist John Harte. I learned how to look for and build the story with photos. Mr. Harte also taught me how to get the most from my camera through editing. Combining the skills of photojournalism with the curiosity of a novice produces a unique point-of-view. 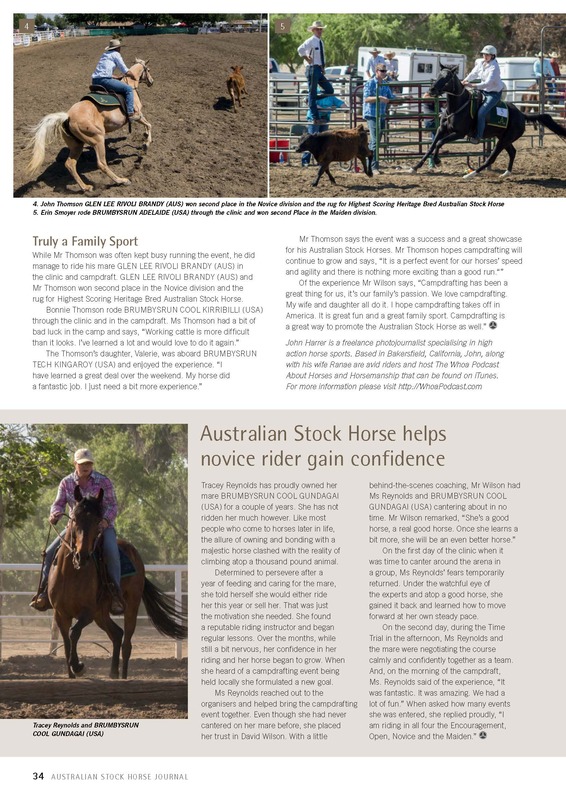 In 2013, I secured an assignment from the Australian Stock Horse Society (ASHS). The first ever sanctioned campdraft event held in the United States was coming to Colorado. 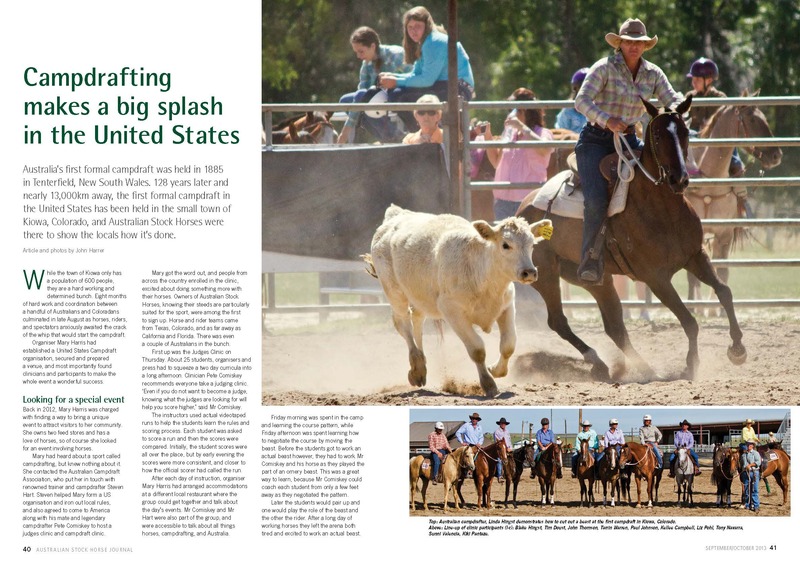 Campdraft is the top sport in Australia. The ASHS asked me to provide photos, an article, and multi-media for their website and magazine. First, was the audio interview with the organizers explaining the sport and generating excitement. Utilizing Skype, I produce an hour-long audio interview could embed on their site. 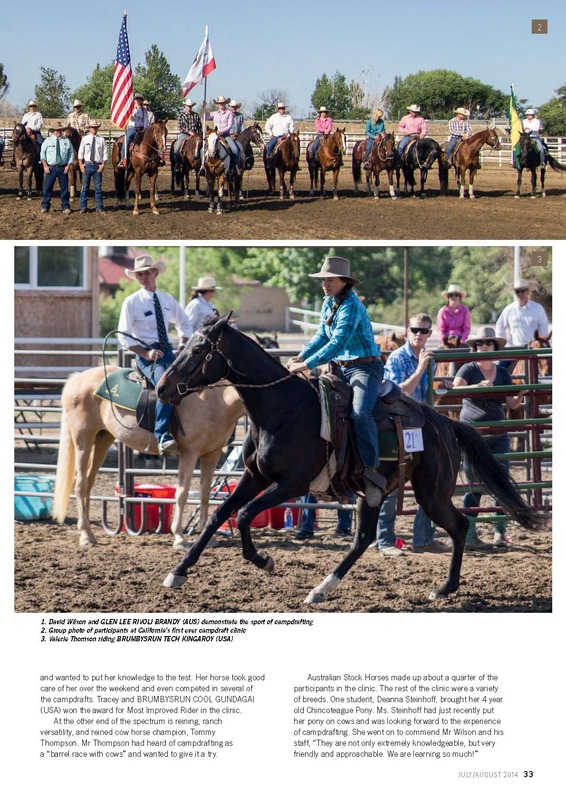 Next, I traveled to the small town of Kiowa, Colorado to photograph the event from start-to-finish, interview the participants, and gather material for the written portion of the story. While on-site, I discovered two vacationing Australians who had heard about the event and had come to participate. On the day of the competition, I was able to capture on video the first sanctioned campdraft run on American soil. It was ridden by and Australian, on an Australian Stock Horse, and happened to win the first division. High-speed internet was not widely available in Kiowa. There wasn’t even a local hotel to accommodate me when a thunderstorm destroyed my camping equipment. Yet, I was able to use local resources to upload the video story of the first run to Australia within hours. Australian campdraft woke up to their hometown boy making history in the United States. 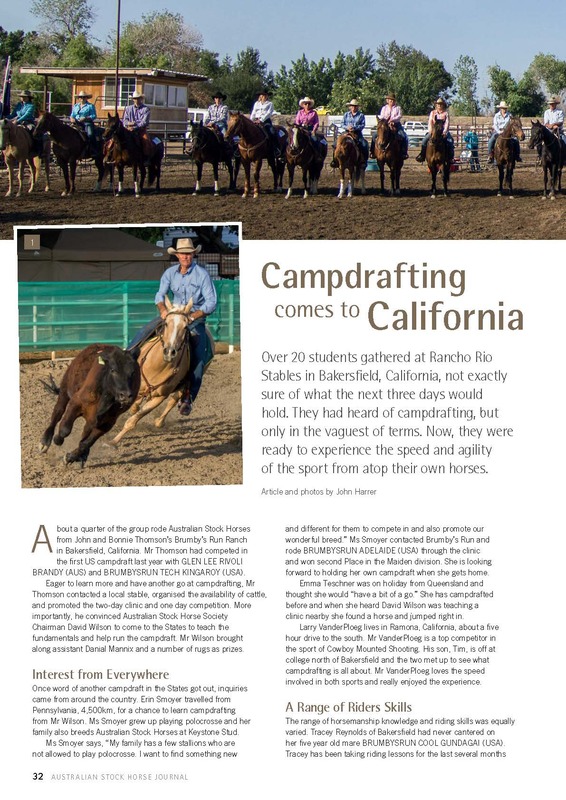 The campdraft experience also taught me the value of a deadline. The ASHS needed the article and photos for their bimonthly publication four days after the event. If I didn’t make it, the story, while valuable would lose much of its “punch”. I was able to provide a full selection of photos and copy to the publication a full day before the deadline. Because my horse experience began so late in my life, I found there was much to learn. After every ride, clinic, trail trial, vet visit, and any other horse experience, my wife, Ranae, would talk about it. We deconstructed events, evaluated mistakes, and explored ways to improve. One evening, after a fruitful discussion, we both talked about how much farther along with our horses and horsemanship we would be “if we only knew then, what we know now”. One evening, after a fruitful discussion, we both talked about how much farther along with our horses and horsemanship we would be “if we only knew then, what we know now”. We realized that we weren’t the only people in the horse industry to feel this way. Then, we realized our horsemanship had improved because of our discussions. 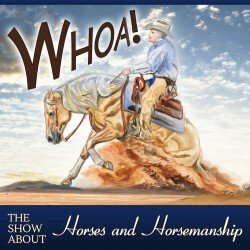 We looked at aspects of the horse industry we wanted to learn more about – subjects others would be interested in to – and created the Whoa Podcast about Horses and Horsemanship. Each week on the show we tackle some aspect of horse ownership. We talk to veterinarians, trainers, competition organizations and others to help people like us learn more about horses. As a compliment to Whoa Podcast, I use my video editing skills to produce companion videos enhancing interest in the disciplines we explore. For example, a recent podcast about Extreme Cowboy Racing was followed up by a series of videos covering an event. A video featuring the main judge of the event, Bill Cameron, demonstrated how competitors could improve scores. By showing scenes from the event and learning tips, horse owners are encouraged to participate in these events. Listeners to the Whoa Podcast have gotten to know us over the years. They know our skill levels and our horses’ skill level. Many may have thought about trying out this sport but, because of a lack of familiarity, have not. Seeing and learning what goes on gets them comfortable with the experience and may encourage them to give it a try. We have done this with trail trials, team sorting, and working equitation and our listeners really seem to enjoy these pieces. As a volunteer for Kern County Animal Services, I filmed, edited and produced a volunteer recruitment video. Looking forward to hearing from you. Email me at JHarrer@pacbell.net or use the form below.